What Is Dijon Mustard and How Is It Used? Dijon mustard is a style of prepared mustard that originated in the city of Dijon, France. You will often see it used in vinaigrettes and sauces as well as putting the finishing touch on a sandwich. It is a pale yellow rather than the typical bright yellow American-style mustard. French-inspired dishes that feature Dijon mustard as an ingredient are referred to as "à la dijonnaise." Dijon mustard is used as a condiment and an ingredient in recipes. 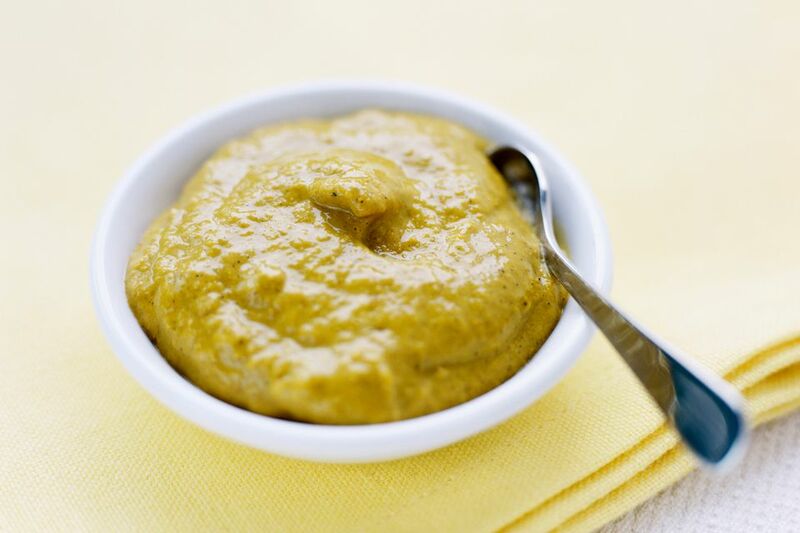 This prepared mustard has a pale yellow color and slightly creamy consistency. It is sold in both jars as well as squeeze bottles. One of the most popular brands is Grey-Poupon. While mustard is usually gluten-free, those who are sensitive should be careful to read the label. It is vegetarian, but some vegans would shun Dijon mustard because the wine used to make it might be processed using animal-based fining agents. Dijon mustard originated in the city of Dijon, which is the capital of the Burgundy region of France in the eastern part of the country. The Burgundy region (called Bourgogne in French) has a rich culinary history and is especially known for its wines. Mustard is grown in vineyards as a cover crop beneath the rows of vines, providing nutrients to the vines when it is plowed under. By the 1200s, Dijon, France, was recognized as a significant area for mustard making and is now regarded as the mustard capital of the world. King Philip VI first used the mustard in 1336 which became popular roughly 500 years later when Jean Naigeon created the formula that replaces vinegar with verjuice (verjus in French), which is a juice made from unripe grapes. The most famous brand, Grey-Poupon, was created in 1866 by mustard maker Maurice Grey with a recipe including wine, and his financial backer, Auguste Poupon. At one time, any product called Dijon mustard had to be made in or around the city of Dijon—a so-called "protected designation of origin," as is with Champagne or Parmigiano-Reggiano. Mustard produced elsewhere had to be called "Dijon-style mustard" or simply "dijon mustard" with a lowercase "D". Today, however, the term "Dijon mustard" has become generic, so any mustard using the basic Dijon recipe can be called Dijon mustard. Dijon mustard is made from brown mustard seeds and white wine. One of the crucial ingredients in traditional Dijon mustard is verjuice. This tart liquid gives Dijon mustard its characteristic flavor. The original recipe includes white wine from the Burgundy region, like Chablis or Bourgogne blanc (which are made from Chardonnay grapes). Dijon mustard has a tangy, sharp, and strong flavor with a bit of spice. The commercial recipes made today use an ingredient with a low acidity level in the mustard, which allows the potency of the mustard seeds to shine through. As Dijon mustard is a condiment, it can be used as a spread any time mustard is called for when you prefer a more potent mustard flavor. It can top a hot dog or be smeared on a roast beef or turkey sandwich. Dijon is the perfect pairing for a corned beef or pastrami sandwich on rye bread since a spicy mustard is called for. But this tasty, prepared mustard is also a key ingredient in many different recipes, such as vinaigrettes and sauces as a little bit of Dijon goes a long way. Dijon mustard is also a common ingredient in salad dressings providing a bit of tang as well as a nice thickness. It is also used in many barbecue recipes as a flavorful layer that helps keep a rub on the meat. Dijon chicken is a common "à la dijonnaise" dish that can be made with or without cream. When incorporated in a sauce, it can turn simple dishes such as pork chops and steamed asparagus into something special. Dijon mustard is readily available in the condiments aisle of the grocery store along with all of the other types of mustard. Until somewhat recently, it was only packaged in a glass jar, but now you can buy Dijon in a squeeze bottle for easy dispensing. Making Dijon-style mustard is fairly simple; it's mostly a matter of grinding up brown or black mustard seeds and puréeing along with white wine, vinegar, and salt. It is important to soak the mustard seeds before using them, though, and you need to refrigerate the finished mustard for 24 hours before serving. If you are inclined to make truly authentic Dijon mustard, you should include the verjuice, if you can get your hands on some. Nevertheless, lemon juice or vinegar is a fine substitute. Once opened, jars of Dijon mustard should be stored in the refrigerator and will last one year past the best-buy date. Unopened jars will keep two to three years past the best-buy date in the pantry. The taste may not be at its peak, but it is still good and safe to eat. Dijon mustard adds a lot of flavor to food without adding much in the way of calories. One teaspoon of Grey Poupon, for example, has only 3 calories. Using mustard instead of mayonnaise, for example, is a healthy swap. While it does have 135 milligrams of sodium, you may be able to do with less added salt in your dish due to the flavor enhancement. You usually don't use enough mustard to benefit from its vitamin and mineral content, but a teaspoon of Dijon mustard provides less than 1 percent of your daily value for calcium, iron, and vitamins A and C.